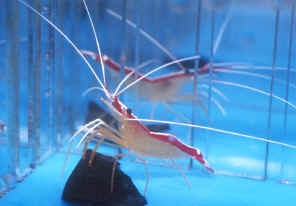 Lysmata amboinensis awaiting customers at a wholesalers. Update : Shrimp Mix Hi Bob, I appreciate your encouragement on my fish mix. Here's a report on a past question: I asked what shrimp could be mixed in a 300 gallon reef tank to avoid the Shrimp Wars. You indicated that I should be able to add some Lysmata debelius to the five large L. amboinensis that are already there. I added two L. debelius to the tank. They hide most of the time, <Very typical... the Debelius' Shrimp will become more evident with time... but not as much as the Ambon's> whereas the L. amboinensis are always putting on a song and dance for the tangs. Too bad; those white legs are something! Both types of shrimp even seem to like the same area of live rock; no problems that I have seen. The only time I really see the L. debelius is at feeding time. Once the food hits the water, they are out with their boxing gloves on ready to take on any fish that get in their way! Do you suppose they may come out more as they become more used to the environment? Or are these guys just the hiding types? <Oh! Yes and yes> Next step is to add three more L. debelius and see if the congeniality continues. 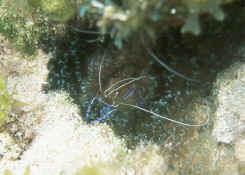 If I am successful, I am inclined to add a mated pair of Stenopus hispidus. Do you think they would fit in OK with the others? <Yes... likely on trouble might come with molting, possible hunger... Provide plenty of hiding spaces, regular feedings, and leave molts (the exoskeletons) in place for speedier regeneration/hardening of new external structures... by ingestion of old> As always, thanks for the input. It is reassuring. <As the universe is, so should we be, as we are. Bob Fenner> Dale. Earlier I told you about having a tang (with ick) in another tank (5 gal.) and you told me to get Lysmata shrimp and/or goby for my main tank before putting the tang back in the main tank If I get them I won't have a place to quarantine them...is it just alright to fresh water dip them and then put directly into the main tank. What are the common names for these two...is the shrimp just called a cleaner shrimp? Cleaner Shrimp Question Bob, Can you tell me a positive way to tell the Indo-Pacific Cleaner Shrimps from the Atlantic variety? <Of the genus Lysmata? Yes... differences shown, link provided to more... on the Cleaner shrimp files, FAQs... on our site: www.WetWebMedia.com> I had one cleaner shrimp in my tank and decided to buy a second so they would possibly produce fry for fish and coral food. I am suspect as to whether the two that I have are actually the same species. The only difference between the two of them is the coloration on their tail. I have read on several web sites that the Indo-Pacific variety has the inverted "T" at the base of the tail and the Atlantic variety is supposed to have the white stripe go all the way from head to the end of the tail. I am assuming that the Atlantic variety is not supposed to have the inverted "T". Is that correct? <Yes...> I have been looking for pictures of both of the species on the Internet to try and find a definite answer, but all of the pictures I have found look the same or don't show the tail area good enough for a positive identification. <See our site or Baensch Marine Atlas v.1...> Also, if one is Indo-Pacific and the other is Atlantic will they still mate or did I just waste my money? <They will not produce viable young as far as I'm aware... you may want to posit your question to the folks at "The Breeder's Registry" as well... link on WWM. Bob Fenner> Thanks for your help. Chad N.